Shock: He crashes onto a landing mat, having failed the simulation test for long-distance flight. Thoughts: Chris Lowder’s second Future Shock, like the first, plays the format for laughs and, with an excellent early outing from the ever-so-slighty-famous Brian Bolland, the great art pairing means this comedy Shock works really well. 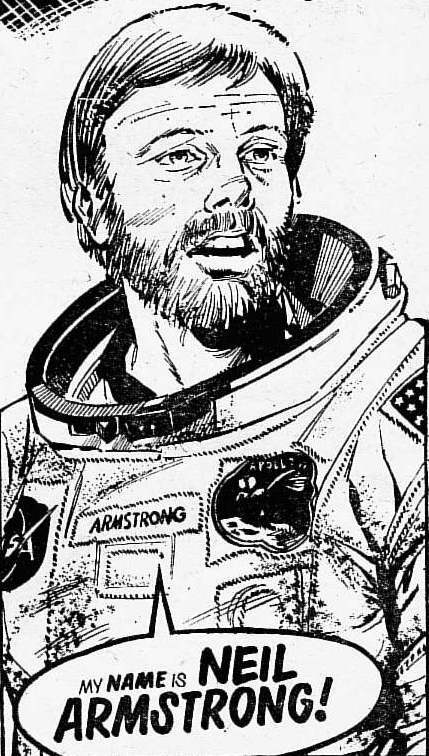 Unusually the narration in the second person giving the strip a creepy Twilight Zone voice-over effect which, added to by the limited verbal outbursts of the of the astronaut himself, works to make the reader become the panic-stricken pilot. After two pages of building mania the pay-off on the third page, with the simulator and frustrated trainers suddenly revealed, is an excellent switch and done in the manner of that ‘page-turning’ revelation which only a physical comic can deliver. 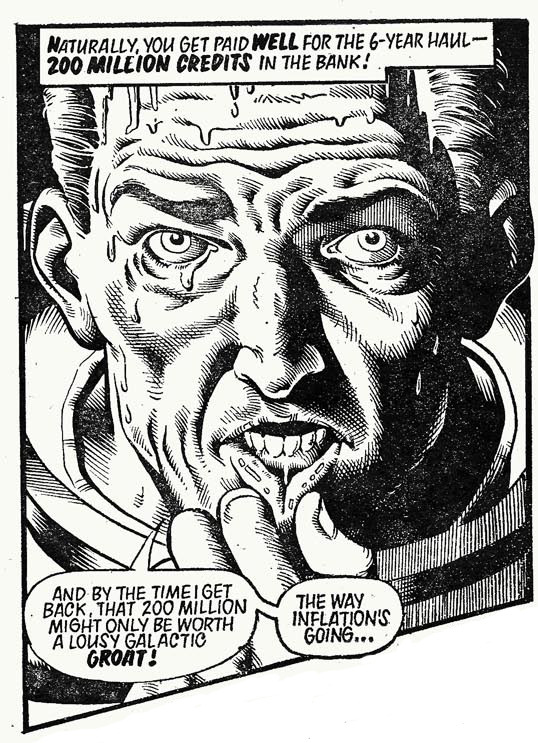 However more than one of 2000AD‘s young readership may have been baffled by the discussion of the effects of inflation on savings. Bolland’s art needs little comment, some anatomy is slightly wonky and the final panel showing the astronaut being restrained has a very unconvincing struggle between crazy astronaut and hospital orderly but there is much to savour in his famous inking style and the under-lighting on faces helps ramp up that Eerie comics feel of the whole strip. An excellent Future Shock and one, despite the fame of its artist, that has been rarely reprinted. Shock’d? A top-quality shock, the mania of the spaceman builds fantastically and before the reveal comes there is no indication this is a simulator yet when the veil drops it all makes sense.